If only I could predict the lottery numbers every week that well! In the end, the S&P 500 gained 26.5% in 2009 which is almost exactly what it did in 2003. There are few similarities as to why the market turned around in 2003 and 2009, but it did. Early in 2009, the market was just completely oversold. Everyone was so worried that every single company was going to go out of business that they quite literally sold everything (including bonds and preferred stocks). When the turnround came, it was strong. Moving forward into 2010, it is definitely hard to see what areas of the market will stage the best performance, so since almost all of you seldom make changes to your portfolios, you must continue to diversify your portfolio - if nothing else, rebalance from last year! Do not load up on international funds just because they had the best performance in 2009. International funds are somewhat more volatile because the international markets are more volatile, but there is also the currency trade which can help or hurt the fund's performance. If you wish to be more aggressive, adding a bit to your international holdings is a great way to accomplish this goal, but do not over do it! On the bond side, just like in 2009, investment grade and inflation protected bonds (TIPS) look to be some of the best options. Government bonds should do poorly again in 2010 just like they did in 2009, and there is just about zero reason to be in them right now. As I said last year, "As for the rest of the account, you really need to continue to research the funds that you have available. A good diversification model that would now include the investment grade and inflation protected bond funds would be excellent. Remember that if you only look at last year, you will be missing the point. Look at good and bad years, look at changes in the managers, etc." If you look back through history, the second year of a recovery is generally not as spectacular as the first year, but it is usually still a good year. The goal here is to reap returns when we can and mitigate the losses in a bad year. Keep that in mind, and you will almost assuredly do better than those that try to time the market. I wish everyone only the best in 2010, and I hope it is a very prosperous year for all of us! Welcome to 2010! The new year has started much like the old year finished with a market steadily moving forward. Whether you believe the market is headed higher (a bull) or the market will go lower (a bear), how should you be playing the market and economy? I have spent the last month or so researching the trends and patterns of 2009, and in some cases, I have gone back to previous economic downturns to try and find similarities to see how things moved forward. Yes, it is that history buff in me that leads me to research the past, but it is sometimes weird how the present really will look like the past. Over the next few weeks, I'll be writing about investing options for 2010 (I had a similar post in 2009 that worked out very well - 2009 Investment Options for your 403(b)), the various issues facing President Obama and Congress, and then a post on planning for retirement for those retiring this year. All in all, I hope that everyone had a great holidays and first two weeks of 2010. 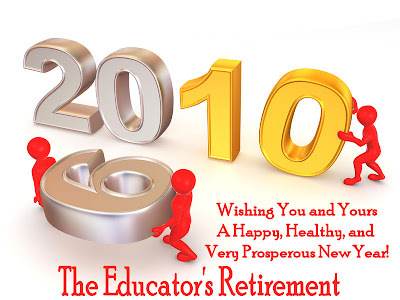 I look forward to a great 2010, and as always, if you have questions or comments, please by all means email me. It really is some of your own questions that give me ideas to discuss in future posts. As we ring in the New Year, let's say goodbye to a 2009 that saw an economy out on a ledge at one point only to rebound and become a great investing year. While there will always be ups and downs in the market and economy, may your health, happiness, and fortune always prosper. I hope 2010 is a great year for all of you.